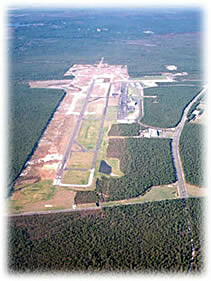 Proposed upgrades to the Robert J. Miller Airpark in Berkeley Township get a public hearing tomorrow night at town hall. Environmentalists will be there in full force. The Federal Aviation Administration, pilots and public safety officials have long cited the need for a crosswind runway at the airport, something Theresa Lettman with the Pinelands Preservation Alliance doesn't dispute. The problem is the land they want to use on the site is covered by trees and protected from development. There are major concerns about what the project would do to the wildlife in the area in the pine barrens. The Pinelands area covers seven counties while preserved acreage runs through Ocean, Burlington and Atlantic. Lettman is against the Freeholders dipping into their Natural Lands Trust Fund to buy over 400 acres of land nearby to offset the purchase. She says "that land is supposed to be left untouched. The money in that fund is supposed to buy new open space projects, not be a vehicle that helps with future development. This could set a dangerous precedent." If approved, this would be the first time in history that a piece of protected land was used for development with approval from the Pinelands Commission. Because officials want to make sure everything is above board, they will host that hearing. Their goal is to hear from as many people for and against the idea as possible and take the information into account when they make their decision. The Freeholders say the project was something the board had developed in the 1970s but due to a lack of funding at time time, it was put on hold. They now have the ability to make the upgrades given the increase in traffic at the airpark. The public hearing takes place tomorrow night at Berkeley Town Hall at 7 p.m.